What is a HTML form? What kind of use cases does it have? A HTML form is the most common way to send data from a client application to a server. 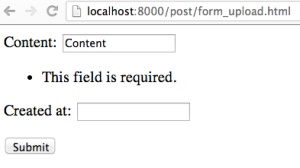 In this article, we are going to learn how to use Django's Form library to handle HTML forms. In one of the previous articles, Writing Views to Upload Posts for Your First Python Django Application, we learned how to use request.POST variable to retrieve data from a HTML form. However, simply retrieving data is not enough because we would probably want to handle data validation and avoid writing the HTML form manually in a template. Auto-generate a HTML form from a form widget. Validate submitted data against a set of rules. Redisplay the HTML form with errors if there's any. Convert submitted data into Python compatible types. Widget: A Python class that renders itself into an HTML form. Field: A Python class that validates the data, e.g. a CharField that limits the number of maximum characters. Form: A collection of fields. Designed correctly, the Form library is decoupled from other Django components, such as the database layer and even templates. By separating the Form library from the rest of Django, we can write and test forms independently from the rest of our application, which increases the maintainability of our application. 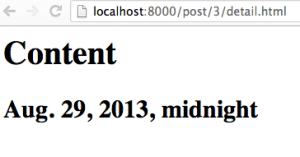 Now let's go ahead and create a form object that represents a Post in myblog/forms.py. Then we create a new view that returns our form in the context. Then we create a new template that renders our form inside an HTML page in myblog/templates/post_form_upload.html. Our page after being submitted. Since both the "content" and "created at" fields are required, you will get an error when you try to upload an empty field. In this article, we learned how to use Django's form library to handle HTML forms. While it's common practice to create an HTML form by hand, creating Django's form objects provides better maintainability, readability and functionality. In the next article, we are going to learn how to use Django's ModelForm to auto-generate forms from models.